In a word cloud, students enter words into a field in response to a question or prompt. The words that all of the students enter then appear instantly as a colorful graphic, with the most popular responses appearing largest. The graphic becomes larger as more students answer. Students can both see the way their peers have answered and contribute their thoughts to the group. 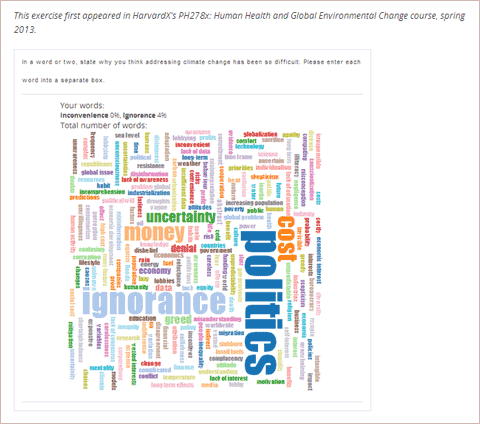 For example, the following word cloud was created from students’ responses to a question in a HarvardX course. To enable the word cloud tool in Studio, you add the "word_cloud" key to the Advanced Module List on the Advanced Settings page. (Be sure to include the quotation marks around the key value.) For more information, see Enable Additional Exercises and Tools. In the component editor, specify the settings that you want. You can leave the default value for everything except Display Name. Display Name: This name appears as a heading above the problem. Inputs: The number of text boxes into which students can enter words, phrases, or sentences. Maximum Words: The maximum number of words that the word cloud displays. If students enter 300 different words but the maximum is set to 250, only the 250 most commonly entered words appear in the word cloud. Show Percents: The number of times that students have entered a given word as a percentage of all words entered appears near that word.